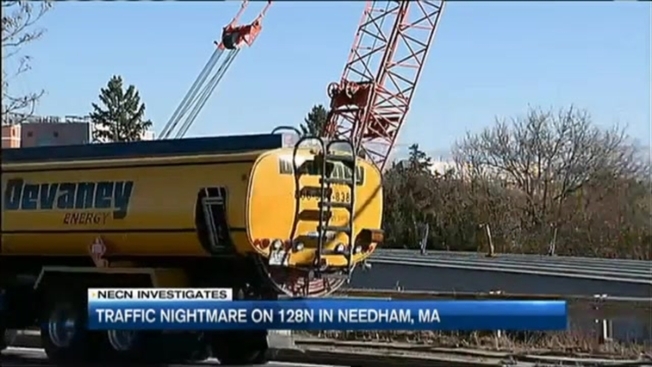 Hundreds got stuck in a 10-mile backup on Massachusetts Route 128 North Tuesday morning. This stemmed from crews installing steel girder bridges that will carry the highway over a stretch from Route 135 to Great Plain Avenue. The problem was joint compound. A spokesman for the Massachusetts Department of Transportation says that crews from McCourt Construction installed a new expansion joint overnight and applied joint compound. It didn't fix the problem in time for traffic to safely travel underneath. MassDOT had to keep two northbound lanes shut down for hours. The compound is not holding the bridge together, but Francis Hopcroft, Professor of Civil Engineering at Wentworth Institute of Technology, told us the state likely didn't want to risk the wet material dripping onto the cars below. "If it hits the windshield it's going to be smeared. The first reaction is to hit the windshield wipers, the second reaction is to crash," said Hopcroft. Commuters wonder why the work couldn't have been done at another time. "I'm sure planned earlier in the morning, so it would have time to cure, but things happen in a construction project. It's not always controlled," Hopcroft replied. Samantha Drinkwater had to fuel up in Newton before her drive back home to Woburn. Her car was out of gas after a hellacious morning commute. "It was just a crawl," she said. The construction turned the normally 40 minute commute of Heather Troika of Stoughton, Massachusetts, into a two hour one. Massachusetts Deportment of Transportation Spokesman Mike Verseckes declined to speak on camera, but told in a statement, "MassDOT understands the frustration drivers have experienced and we apologize for the inconvenience this has caused." MassDOT met with the construction team this afternoon. They have not released what, if anything, came out fo that meeting. There is still much work left to do on this $98 million project that is supposed to be finished by the end of the year.